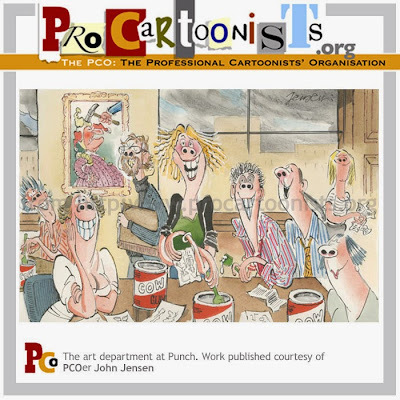 PCO member John Jensen offers a memory of things at Punch magazine. This article was originally published in the Foghorn magazine, which the PCO publishes. Punch died in 1992. Towards the end of its life the atmosphere in the art department was bright, lively and smiling. I thought such camaraderie was inspiring amid all the rumours of imminent collapse. Until, that is, I realised the entire art-department was working with opened tins of Cow gum on the desks and tables. Cow gum was an essential item for pasting down the pages in those pre-software days when these things were done by hand. Cow gum was necessary but Cow gum was glue. Tins of it were always open in the art room. Whether the art room knew it or not they were glue-sniffing all day long. Happy daze. The atmosphere had been quieter, more sedate – less Cow gum – except for occasional brief outbursts of either rage or pleasure when Bill Hewison, was Art Editor. A bearded man of fiercely held beliefs constrained within a polite, conservative manner contrasted nicely with his sidekick, Geoffrey Dickinson, a quietly funny guy who heralded the Swinging Sixties with a cover for Time magazine, the payment for which allowed him to buy his home. Punch payments never matched that. A third party, sitting hatted, hunched and shirt-sleeved in the office, personally saturnine and professionally ubiquitous: Michael Heath, looking, as always, younger than his experience. Physically, Bill and Geoffrey reminded me of Don Quixote and Sancho Panza, but the imagined similarity ended there. Bill’s humour, when it surfaced, was so dry it crackled like tinder. Punch had its institutions: its weekly lunches and its outings. At the lunches the editor would sit at the head of the famous Punch table overseeing guests and Punch regulars. As a general rule, although there were exceptions, cartoonists would sit below the salt leaving the writers to do most of the talking, at which they were very good and very practised. The pen-and-ink boys tended to mutter and snigger among themselves. The late and truly missed Alan Coren, more jovial, bouncy even, bursting with words and ideas had to get the chat rolling, along with the coffee and cigars. Billy Connolly – the Big Yin – a welcome guest, was heard to assert that sexual fantasies were fine until you turned them into reality when they were, unfortunately, found to be disappointing. A silence followed this pronouncement. No one had the bottle to ask what those fantasies were. And how did he know? These days he would have been pounded with questions and answers would have been demanded. The outings were different: sometimes a trip up-and-down the Thames with Wally Fawkes gigging it for the evening. Or maybe a visit to France, or maybe a plush hotel in the country, the name of which I can’t remember – I don’t keep a diary and I have no memory for names or details: useless, really! Pat, my wife, on seeing a coach filling up with elderly ladies and gents, stooping and making serious use of walking sticks said jokingly, “I expect that’ll be the Punch outing.” It was. However, not everybody was old, just some. (If Punch hadn’t died I’d now be one of those old geezers.) Among the now deceased is the “Matisse of cartooning”, Michael ffolkes. Michael was fond of his booze but, what was not then realised , and which tragically was discovered too late, was that he was also allergic to alcohol. Not a good combination. Unsurprisingly, Michael was given to unsettling mood changes. He could be, and often was, charming and amusing, yet both virtues were too often overwhelmed by a scathing acerbic wit and an aggressiveness which was not threatening but certainly irritating. Invariably forgiven for his lapses (by me, if by no one else) Mike was, in spite of himself, a nice bloke and, on a good day, a wonderful companion. At the lunches he was expansive, cigar-smoking, brandy drinking and serene and secure in his talent. Most of the cartoonists around the table were like that. I’ve exceeded my 600 words. The jog down memory lane ends here.